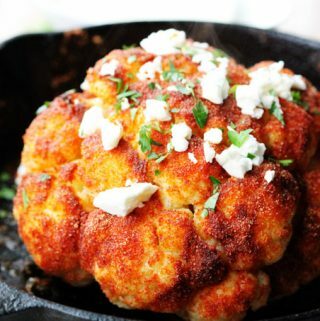 This Whole Roasted Cauliflower with Mediterranean spices and feta, then drizzled with lemon juice and sprinkled with parsley, is incredibly flavorful and very easy to prepare. If you want to impress your guests, try this recipe. 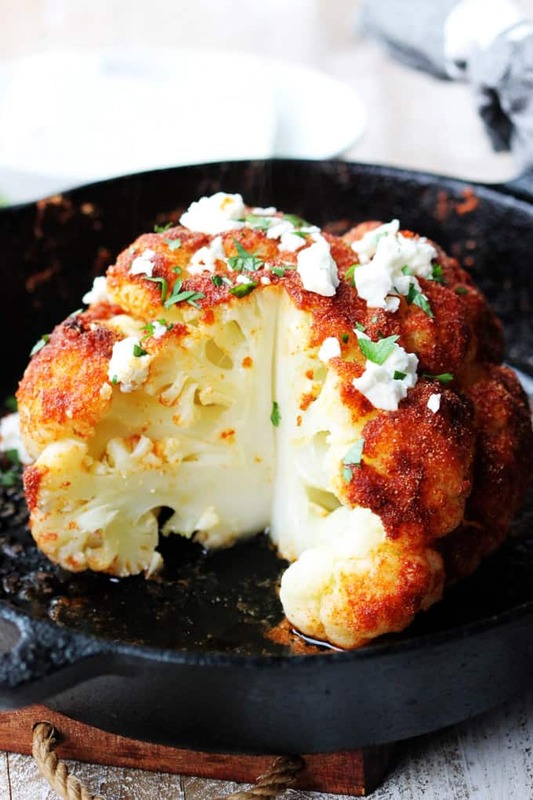 Why make Whole Roasted Cauliflower? Second, a whole cauliflower manages to keep its earthy, sweet flavor as the moisture is drawn out. And third, it’s very easy to prepare (I will show you 2 easy techniques below). 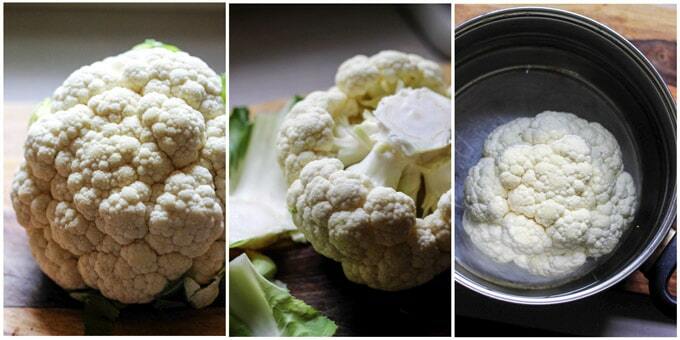 If you are on a look out for an easy cauliflower recipe, this is the one. 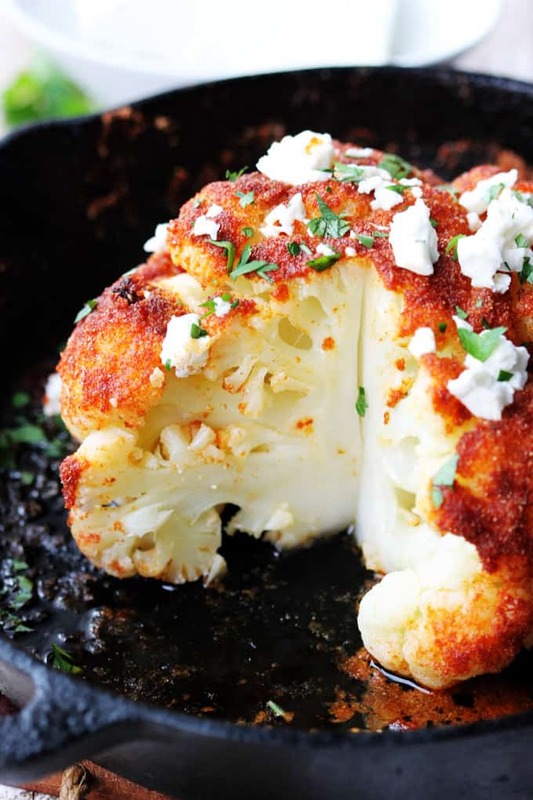 So, what’s so special about this Roasted Cauliflower? I think that the simple answer to this question is its: versatility. I made mine Mediterranean Style, with some Mediterranean spices like (smoked paprika, cumin and garlic), feta, lemon juice and olive oil. Tahini Sauce – I made this sauce for the chickpea egg fritters but it works great here too. 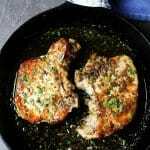 You can also serve it straight without any additions, or just sprinkle it with Parmesan cheese. Instead of olive oil you could also substitute in butter or even some bacon fat and then sprinkle it with some bacon bits. In fact that’s a super delicious way to get even your non-cauliflower eaters to eat it. How to roast whole cauliflower? Below, I’ll show you two easy techniques for roasting whole cauliflower, one is quicker but it requires a little bit more preparation whereas the other is simpler in preparation but requires more time to cook. Roasting whole cauliflower with a pre-boil. This is my preferred method when I am short on time and this is the one that I’ve featured in this recipe. 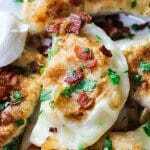 Remove from the oven, place on a serving plate (affiliate link), garnish with feta and parsley and drizzle with lemon juice and extra virgin olive oil. 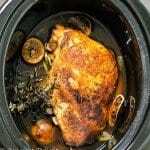 Add 1 cup of water or vegetable broth, then cover with foil, and place in the oven for a half an hour to steam. 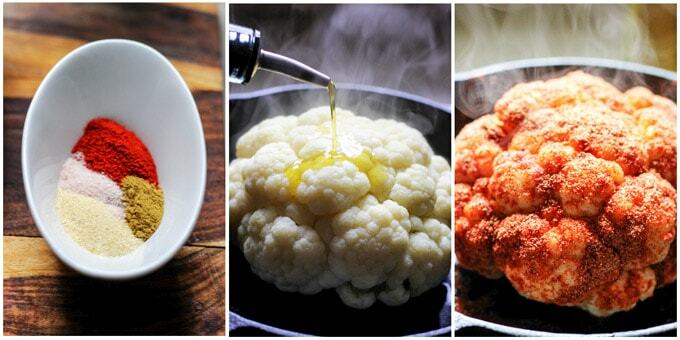 Remove your pan from the oven and gently transport your cauliflower onto a serving plate (affiliate link). Add feta, parsley, lemon juice and extra virgin olive oil. Alternative: Roasted Cauliflower Steaks instead of the whole roasted cauliflower. Roast your cauliflower for 15-20 minutes, flip over, sprinkle some more seasoning and roast for an additional 10 minutes. 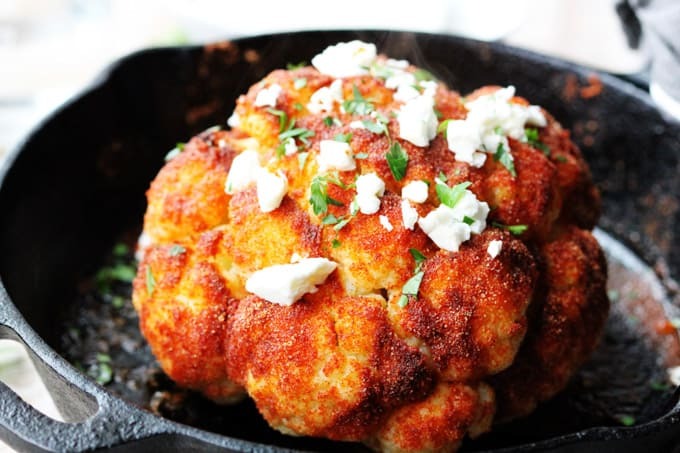 What to serve the roasted cauliflower with? You can store leftovers in a refrigerator for up to 4 days. You can use them with salads or soup. This Cauliflower Coconut Soup could work perfectly with these roasted cauliflower leftovers. 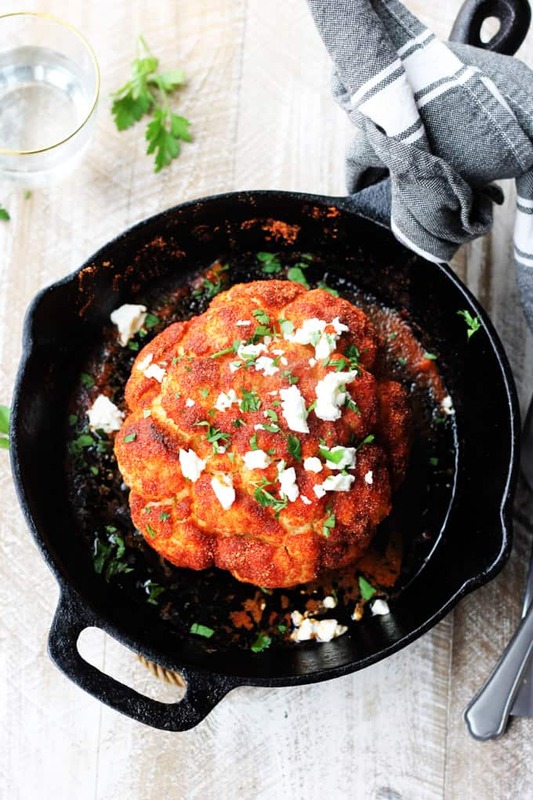 If you want to impress your friends and family, serve them this whole roasted cauliflower. It really plates beautifully. And if you make it, then I encourage you to let us know which method you used to prepare it and how it worked out. 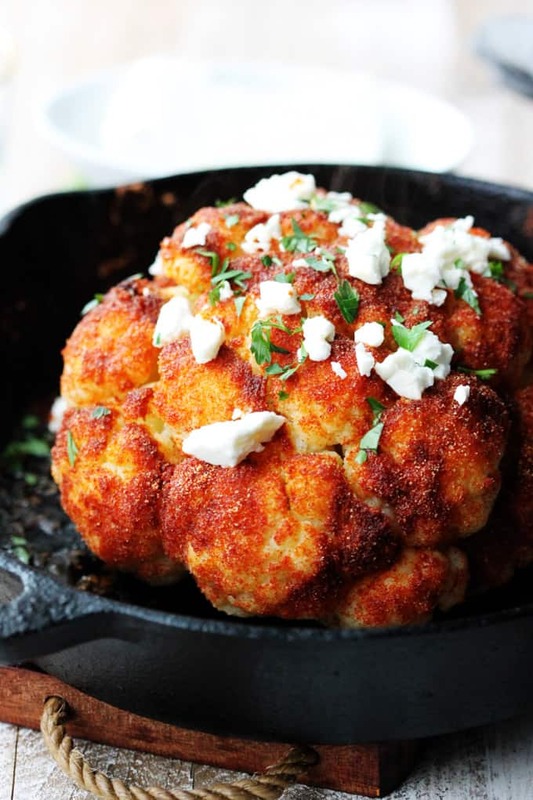 This Whole Roasted Cauliflower with Mediterranean spices and feta, drizzled with some lemon juice and sprinkled with parsley is very impressive, incredibly flavorful and very easy to prepare. If you want to impress your guests try this recipe. Serve with some extra feta and lemon wedges on a side. Enjoy. Cauliflower is one of my fave veggies and I could eat it everyday with dinner. Love that you roasted the whole head and especially that you used smoked paprika – that stuff is delicious! I love roasted cauliflower but always chop it up first. The tips are great and totally want to try this method! Awesome. I hope you will like it Matt. I’ve never made cauliflower this way before, and now I can’t wait to try! Thank you Jessica. I hope you will like it! I have always wanted to make something like this. Your version looks delicious! Oh my word! The color of the cauliflower is exquisite! Such a lovely golden! This would be fun to try on the grill this summer! Definitely saving this recipe!